Production continued in Metamora on Saturday morning. 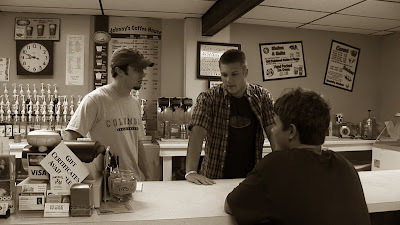 We transformed "Johnnie's Coffee Shop" into "Joeseph's Coffee House" for the film. Pictured above are my Brother's and I on-location. Although we had to work around real customers at the coffee shop, filming still went smooth. We also had a few special guests make appearances within the scenes. It was the first non-sweat-filled day and we got a lot done. I return to Chicago tomorrow to return to school and to get heavy into post. I will be returning home in the next few weeks to continue shooting.